About 23% of Americans don’t like both Trump and Clinton. Many of these people are considering third parties, or would like to be considering them but don’t feel they can safely do so because of the American voting system, which makes it very difficult for third parties to win and ensures that people who vote third party get no say in the choice between the two major party nominees. Some people have talked about wanting to switch to proportional representation (PR) to break the stranglehold of the two parties on politics. Under PR, if 8% of the population votes for a Green or a Libertarian, 8% of the legislature is comprised of Greens or Libertarians. If no party is able to put together a majority of votes, parties have to cooperate in coalitions to get things done. PR is in Jill Stein’s platform and some libertarians have expressed enthusiasm for it as well. PR cannot really be applied to the presidential race, because the president can only be one person–he or she cannot be 8% Green. But for presidential races we could employ a ranked ballot system allowing for an instant-runoff. On this system if you voted for Jill Stein your vote could be transferred to Clinton after Stein is eliminated. This may sound intriguing, but PR is not a magic bullet and it can produce some very bad situations that we should consider. Wallace believed that Johnson and Humphrey were traitors to the south and its values and he decided to mount a third party campaign as the nominee of the “American Independent Party”. This party still exists to this day, and many people in California wishing to register as independents accidentally affiliate themselves with it. What happens with PR and ranked vote? To start, the American Independent Party could have contested congressional elections and won seats for itself there. Many more voters could have supported Wallace, and it’s much more likely that Wallace and his supporters would have succeeded in holding the balance of power. Wallace won over 13% of the vote nationally without PR, finished under 5% in 8 states, and exceeded 30% in 8 as well. Deal with the Devil: Either Humphrey or Nixon or their parties could eventually cave and cut a sinister deal with George “Segregation Forever” Wallace, screwing over African-Americans up and down the country. In Israel, PR has resulted in center-right Likud making a deal with Yisrael Beiteinu, a hard right party led by Avigdor Lieberman which supports legislation banning the Muslim call to prayer. Stalemate: Both Humphrey and Nixon and their parties could refuse to work with Wallace and his followers, resulting in a political stalemate. Generally when this happens in systems with PR, new elections are held to try to break the stalemate. This is currently happening in Spain, where the two strongest parties refuse to cut deals with more extreme minor parties and refuse to work together. 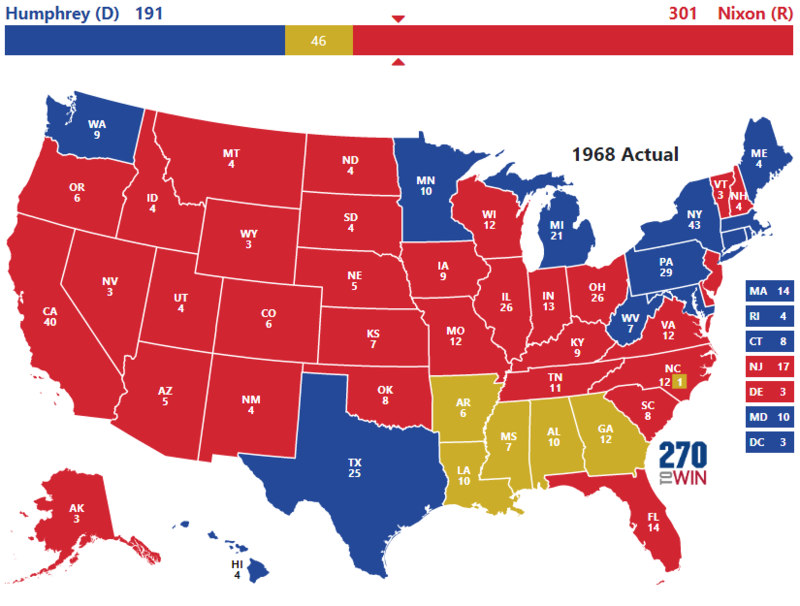 Now, it might be suggested that with PR 1968 would have played out differently–McCarthy could have run third party and turned it into a 4-way race. But McCarthy probably wouldn’t have taken many Nixon or Wallace votes. Humphrey and McCarthy would happily have worked together, but they still probably would not have had 50%, leaving Wallace sitting between a Humphrey/McCarthy coalition and Nixon. No matter how you slice it, PR would have empowered a small extreme minority to hold the rest of the country hostage over segregation. Social Security really needs to be reformed. Medicaid probably needs to be capped when it comes to the states. Medicare, there needs to be some sort of means testing. The [Social Security] retirement age needs to be raised. A portion of Social Security ought to be privatized, if not all. And there probably needs to be some means testing. It’s a Ponzi scheme that’s not sustainable. I would have the federal government cut Medicare and Medicaid by 43% and block grant the programs [to the states] with no strings. Realistically, we have at least as much reason to believe that our electoral system is protecting us from Gary Johnson as we have to believe it’s impeding the Greens or other left wing movements. The blueprint for the left’s resurgence in American politics is probably Corbynism–taking over the Democratic Party from within, as Sanders has tried to do and plans to continue to try to do in down ballot races through his campaign’s “Brand New Congress” strategy. The British Labour Party establishment attempted to resist Corbyn with every bit as much ferocity as the Democratic establishment has resisted Sanders (including excluding a significant percentage of its own supporters from participating in its leadership contest), but it failed, and the Democratic establishment can fail too, and is likely to do so sometime in the not so distant future if Clinton does not win or fails to improve economic conditions for the young, the poor, and the otherwise vulnerable.